I wanted to buy a scale but didn't want to spend a lot of money. This scale was a steal and did way more than I expected. I've had it for about two years now and it still works great. Compared to other scales in our house and at the doctor it is very accurate. It can store multiple users and will keep the last few times you weighed your self, which is great motivation, or you can just step on and weight yourself. At first it was a little tricky to figure out how to create the user but that was because I didn't read the instructions. The bathroom that it is in has heavy traffic between my boyfriend, his son and our two large dogs so this thing has been trampled and is still in great shape and is still accurate. It is very easy to clean, it wipes right off, and is the perfect size. It fits great in the bathroom and the design is very comfortable to stand on. I wasn't expecting much for this price but honestly i couldn't be happier! 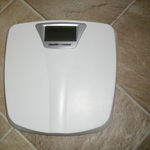 This scale works great if you want an estimate on your weight. I was excited to finally get a scale and start watching my weight, but this gives me different readings every time, no matter how flat the surface is. I would not recommend this. Performance Not the best. Durability This only gets worse the longer it is used. Ease of Use It's pretty simple - just step on the scale and you're set. I purchased the Health o Meter Digital Bathroom Scale about a year ago. I had gotten to the point with my old scale where, if I stood on it 3 times, I got 3 different scores! Before buying the Healthy o Meter, I was a little worried that this was one of the cheaper scales, but I didn't want anything fancy with extras, and this is exactly what I got. I hadn't even heard of Health o Meter which itself was not great. This product is very basic, unflashy, it only weighs in pounds - you don't even have the option of kilograms. However on the plus side, it is reliable, dependable and accurate. I've noticed it doesn't give very accurate results if you place it on carpet but if you place it on tile, wood or concrete, it gives the exact same result every time. It takes just one 9v battery and this seems to last for ages. 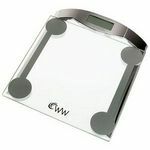 All in all, if you want a basic bathroom scale which is accurate, reliable with no frills and spills, this is it. I wanted to get me a scale for a long time because i wanted to watch my weight, i finally got me this scale and it works great. I love how it works and that it is easy to use. The design is basic. I would defiantly by this again if something happen to the one i have now. I wanted a good bathroom scale for my husband who was on a diet and I thought it would benefit him and I was happy that it did. He can see the progress he is making and I know that it helps him keep to his diet. 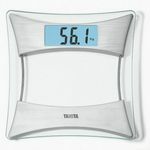 Performance Everytime you weigh yourself on this scale you weigh a different amount. You can step on it check your weight and then in a minute do it again and the weight is different. I know weight fluctuates but I don't think it does that quickly. Durability I have been pleased with how sturdy and durable the scale is. Several family members have used it, and some have not been tiny, and it is still holding up. Design I think the scale should be somewhat bigger. My husband's feet hang off of it when he is weighing himself. His feet are not huge but the scale needs to accomodate feet and be large enough for a whole foot to fit comfortably on it. Ease of Use Very easy to use. Easy to read. You can keep track of the different weights of different people and that enables you to track your progress,which ever way you want to go either up or down. Accuracy I am giving a satisfactory even though I am not too certain of the accuracy of the product. It does at least give you a close enough. I think it is close to your actual weight even though it appears to flucuate some. I would recommend it because it isn't expensive. I very happy with my new Health O Meter Digital Scale. The body has a trim profile. comes in white and black. 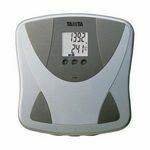 .86" LCD display make reading weight easy. Has a place to put your feet so you get accurately weight measures.Long life lithium battery that included. This is the only scale I own that give the some weight as when I go to the doctor. Has a five year warranty. Accurately measures up to 330lbs. The box says the doctor scale. Performance Still happy with Health O Meter digital Scale still works like when I first brought it. Durability Still working great. Design Design is still holding up. 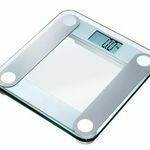 Still looking like it was the dy I purchase the scale Ease of Use Very easy use, just tap and when it says zero you stand on it and get your weight. Accuracy Very good at telling your weight.